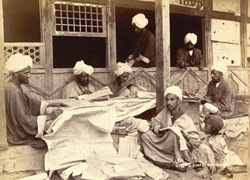 Photograph of carpet designers in the modern-day state of Jammu and Kashmir, taken by an unknown photographer in the 1890s. This image shows a group of workers seated on a verandah, drawing patterns onto paper templates. These craftsmen are known as 'talim' writers and produce a coded form of the design, the 'talim', indicating the number of knots required per square inch and also the colour scheme to be used along the weft threads of wool or silk. This process is extremely complex and may take up to three months. During the weaving of the carpet the talim is fixed to the cotton warp threads of the loom and the master weaver also calls out the pattern from memory to enable the weavers to produce the design more easily.